Stone fabricator and distributor MM Galleri hopes to change the way we look at marble, while harnessing the beauty of the natural stone in a more sustainable way. 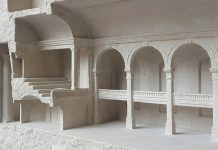 In January 2018, the Indonesia-headquartered firm unveiled its pioneering bended marble technique where stone sliced into thin, malleable layers are applied onto furniture and various surfaces as a decorative layer. This technique minimises stone wastage and utilises offcuts from quarried blocks that are otherwise discarded. 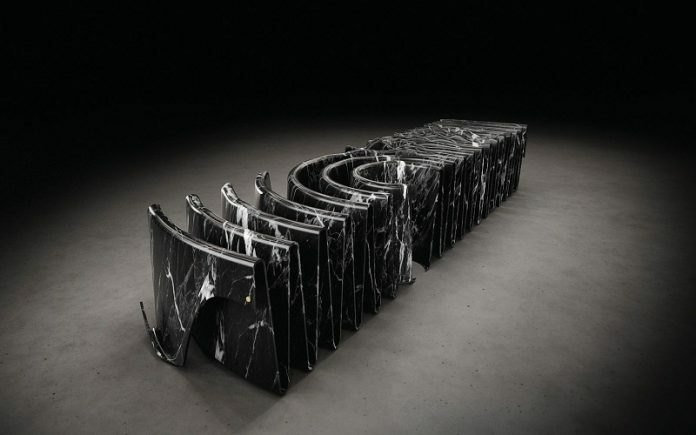 Since then, the company has applied the technique to create stunning showpieces, including an onyx-clad guitar, sculptural side tables and even as a temporary second skin for an automobile. The firm continues to work closely with designers and architects to take the technique to the next level. In collaboration with MM Galleri, Singapore Tatler Homes posts a challenge to three local firms: to create a statement piece that celebrates and utilises the stone specialist’s groundbreaking bended marble technique. When design director Terri Tan first heard about the bended marble technique, she immediately thought of the delicate folds of the art of origami. “The aim of origami is to transform a flat square sheet of paper into a finished sculpture through folding and sculpting techniques,” says the founder of Designworx Interior Consultant. Applying the same origami principle to natural stone, she created a side table with a distinct base with pleats of accordions. 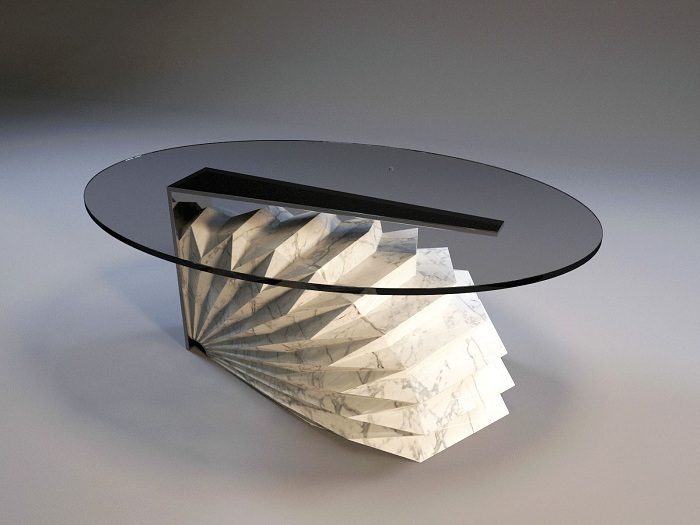 The table comprises a glass top supported by a C-shaped stainless steel structure and a sculptural pedestal clad in layers of marble in accordion-like folds. 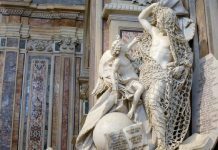 Likewise, while marble is generally associated with Europe where the most famous marble quarries are located, origami is a traditional art that originated in Japan. The designer also sought to pay homage to the historical use of marble in sculptural art. “Our contact with this natural stone has been predominantly in slab format, reminiscent of sheets of paper; albeit very big and thick ones,” she quips. Designed by Terri Tan, founder of Designworx Interior Consultant, this prototype table comes in two variations: Statuario marble, an elegant white marble with black veins, and Black forest, a black marble with meandering white streaks. The supporting C-shape stainless steel structure features a choice of either gold, champagne gold, rose gold or bronze finish, and the glass top can be either grey or bronze tinted to complement the colours of the marble selected for the base. Not one for following the rules, home-grown design practice Upstairs_ strives to innovate and experiment, which makes their collaboration with MM Galleri a fitting one. “We were fascinated by the idea of using a sheet of stone and stretching its surface like a liquid form,” says Dennis Cheok, the creative director of Upstairs_. “The design is not possible if the method of bending marble does not exist. Inspired by the concentric movements of water ripples, Cheok wanted to recreate the ripple effect onto the stone’s surface itself to reflect the movement of water. The result is a mammoth sculptural bench that features undulating waves with different seating groups of vertical ripples. Resembling the look of sharp, compressed waves, this striking furniture mimics the concentric circles of water ripples. The entire bench is clad in Apocalypse, a black granite with thick white veins that has been chosen for its likeness to the fluidity of water. “We wanted the stone grain to appear like a sheet of water, and saw a perfect resemblance with Apocalypse,” explains Cheok. Not only does this bold piece stretch the possibility of furniture design, it also makes room for more inventive ways to approach a rigid material like stone. After poring over various stone materials such as the Athena Grey, creative director Dennis Cheok of Upstairs_ concluded that black marble and granite were more suited to conveying the textures of rippling water. Founded by architect Chan Loo Siang, Inte Architects is known for experimenting with asymmetry and modern architecture, while still retaining a sense of simplicity and functional style in its projects. This design approach is represented in the firm’s prototype for MM Galleri—the architect has created two sculptural lamp concepts inspired by the Japanese philosophy of wabi sabi. 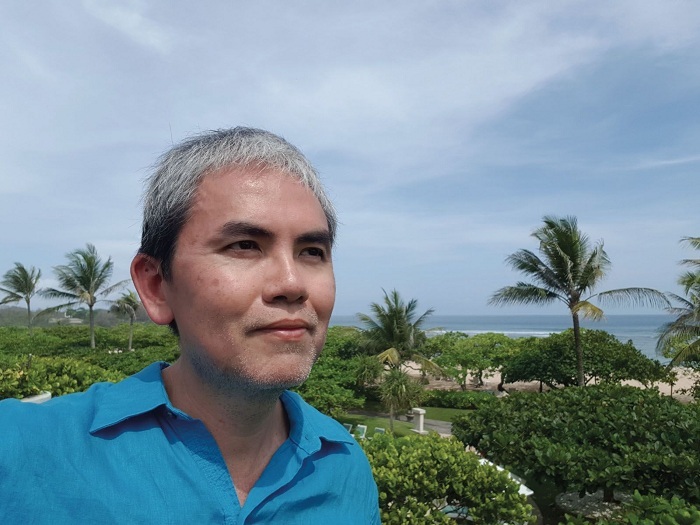 “The concept stemmed from my appreciation of wabi sabi, which is about appreciating the natural state and the beauty of imperfection,” says Chan. Comprising onyx and granite, these artful creations are not your typical lamps. 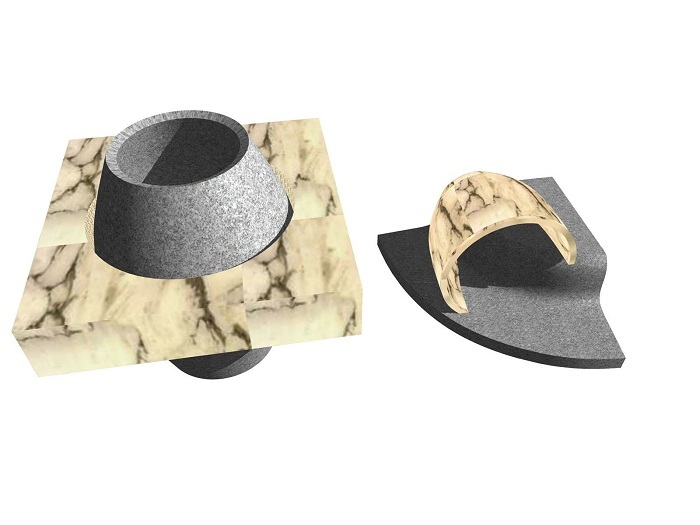 One of the prototypes is a standing granite vase that features a square slab of marble wrapped around a round body. The other plays with the concept of a fallen vase with a vessel-shaped piece of marble lying on its side on a granite base. Inspired by the fragments of a broken vase, the fallen vase’s granite base boasts an eccentric silhouette of sharp lines, undulating curves, and off-kilter angles. LED bulbs create a backlit effect on the onyx surfaces, turning the sculptures into light-giving objects. The contrasting textures selected also add to the unusual qualities of these lighting concepts. It creates imaginative shadow play that celebrates the translucent property of onyx, set against the rugged charms of the granite base. Straddling the boundaries between vase and lamp, furniture and art, these lamps challenge the way we view and use these objects. “The lamps are a celebration of the everyday; I also wanted to reinvent the ways that objects relate to one another when merged in new ways,” says the architect. Designed by Chan, the lamps utilise the translucent quality of onyx, which allows these lamps to cast a dramatic glow when backlit. The architect recommends using a sand-coloured onyx for the lamp shade and Meteorus lilac granite for the base.